Mobility is part of the basics of our life in a modern society – it enables participating in our collaborative lifestyle and therefore progress. Faced with the finiteness of our resources and the tremendous ecological and health related burdens of combustion engines, we are forced to make mobility more environmentally- and climate-friendly in the long run. EVs present an alternative option for mobility to the human’s and nature’s benefit. The German Government, too, has set as a goal to have one million EVs in traffic until 2020. The cabinet, therefore, has already enacted the “Regierungsprogramm Elektromobilität” (a governmental program supporting electro-mobility) and the associated energy-and climate-fund, set up specifically for that purpose. The government will support the automobile industry to make EVs suitable for daily use through promotion of research, tax stimuli and the positive discrimination of EVs in daily traffic. One example under discussion is the allocation of EV-only parking spots. Germany seeks to become the Leit-market and Leit-provider of electro-mobility – a significant increase in sales of EVs was noted by the automobile industry already for 2013. The president of the VDA (association of automobile industry) expects that “electro-mobility will be worthwhile in the near-term future”. This is particularly true for commuters from the peripheral areas of average and large cities. Electro-mobility proves to be the perfect response to the commuting-phenomenon, since it presents a responsible tool of emission-free driving for the future of “living in a green environment” along with the dynamics of commuting. The data calculated by engineering consultants Buro Happold GmbH refer to an average energy consumption and are for informational purposes only. All liability is excluded, all information is given without guarantee. The concept of the apartment buildings „Holistic Living“ picks up right there and takes the energetic aspect of mobility into account with the static principle of real estate. The carbon dioxide-neutral operation of one EV per house or semi-detached house, respectively, is made possible through the PV-units. Apart from the technical edge and the protection of climate and resources, tenants of the houses will benefit from the financial advantages that the concept comprises: while other car drivers regularly get angry about the cost for gas and diesel, the EV barely generates additional cost for the tenants since it is financed via a rent credit note (footnote: the rent credit note covers the E-Smart costs for the lease; the electricity for recharging from the house battery is free). The mobility range of the EV allows easy access to the city center – as an ideal city car the concept “Holistic Living” therefore fulfills manifold and individual mobility requirements. The following metrics apply for the family home: the PV-unit produces 10,000 kWh on average per year, whereas the typical consumption of an entire family amounts to 3,500 kWh/year. Additionally, the brine-water-geothermal heat pump with its geothermal probes consumes about 2,900 hWh/year. Hence, the family home generates an excess of 3,600 kWh/year. An e-smart consumes between 15 and 20 kWh/km – assuming a peak consumption of 20 kWh/km this adds up to 19,500 km available to the tenants every year, through the excess energy. 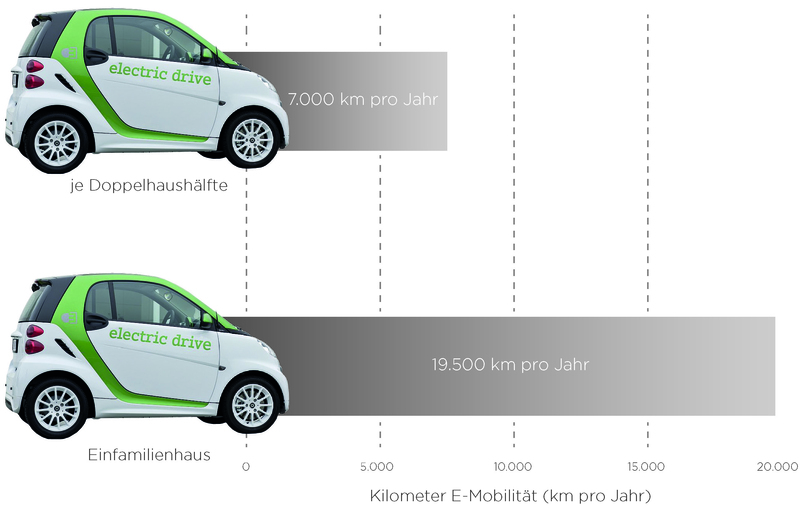 7,000 km per year with a E-Smart car are available to the tenants of the semi-detached houses, assuming typical average energy consumption (the PV-unit produces 6,800 kWh per year; on average, the typical consumption of a family here amounts to 1,900 kWh per year; the brine-water-geothermal heat pump with its geothermal probes consumes about 1,900 hWh/year which adds up to an excess amount of energy of 1,400 kWh per year). 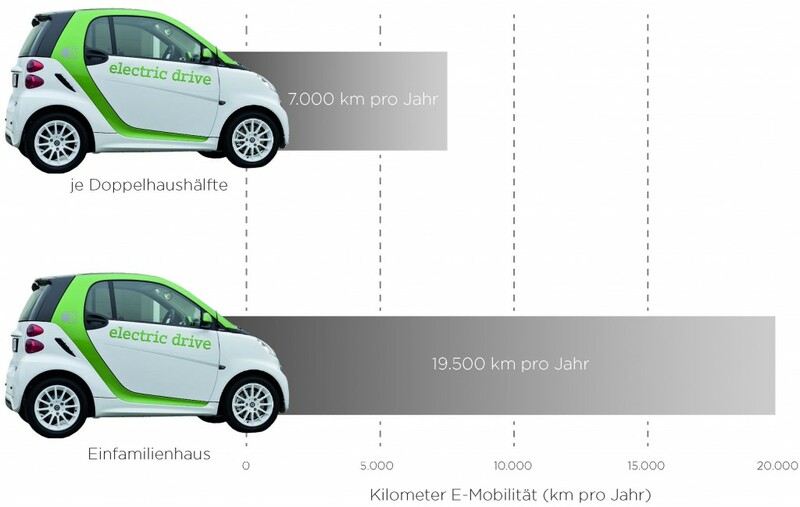 Through emission-free and nearly soundless EV driving the tenants directly protect the climate and resources and support a sustainable energy and traffic policy which serves the public good. Beyond this, they also benefit from the quiet and beautiful location of the houses while nonetheless being connected to the vibrant city center of Berlin via low-cost, sustainable and independent EV. Each building comes with a parking position for the EV. There is also enough space for an additional car. The owner of an EV (not Hybrid) is supported by the landlord through a monthly credit note on rent, which covers the monthly lease fee of an E-Smart. In additiom to that the tenant will receive a benefit of 2000 Euros every three years.